There are so many different types of flowers available at the Edinburgh flowers shop that no matter what it is you’re after, you are sure to find something here. The Edinburgh florists are able to cater for any and all events as they have over forty years of experience under their belts when it comes to floristry so it can safely be said that they know a thing or two when it comes to your orders. Whether it be for a birthday or a wedding anniversary, a work function or a congratulatory event or any other occasion, Edinburgh flowers are able to provide visually stunning floral designs for all customers. All the flowers the Edinburgh florists work with flowers of the best calibre which have been cultivated in the prosperous fields of Holland and then imported directly to the shop. Holland is a wester region of the Netherlands renowned for the premium quality flowers grown there. 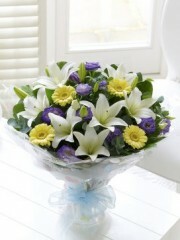 This means that at Edinburgh flowers you will only receive the best possible quality. Not only are the flowers of the best standard, but the Dutch cultivators provide the Edinburgh florists with a vast variety of flowers including traditional roses, elegant lilies and exotic orchids to name a few. 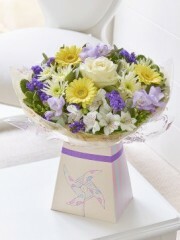 The purple flowers range consist of largely cream, white and purple tones including flowers such as lisianthus and delphiniums. This colour scheme is particularly charming and has proven to be very popular with new born baby bouquets and arrangements as well as for those who favour the colour. You are able to browse through the purple flowers range on the Edinburgh flowers website where the handiwork of the florists is up on the display. The number one priority at Edinburgh flowers is to provide customers with the best service so the team at the shop won’t rest until we are certain you have been provided with nothing short of perfection. All customers are able to use one of several flower delivery services on offer at Edinburgh flowers once your order has been placed. These delivery services mean that you are not required to collect and deliver the orders yourself which is why the Edinburgh flowers team hope that these flower deliveries are of some benefit to our customers. 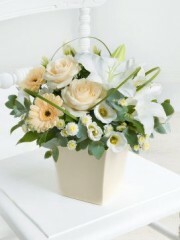 There are three primary flower delivery services which are as follows: standard, next day and same day flower delivery. The standard - as well as the other two flower deliveries - is available six days per week Monday to Saturday between the hours of 9:00AM and 5:30PM. The next day flower delivery service enables you to place an order the day before the delivery meaning that everything is taken care of for you within the space of two days. This next day delivery service is particularly handy for those perhaps slightly more forgetful with dates as it’s quick and efficient. Similarly, the same day flower delivery service allows you to place an order on the day you want it delivered so everything is arranged and sent off within a very constricted time frame. Please note that if you wish to use the same day flower delivery, your order must be placed before 3PM to give the florists enough time to arrange your flowers to the highest standard possible. If you have any further questions about any of the services provided, please do not hesitate to get in touch. You can either send an email or give the shop a ring as there is always a team member of Edinburgh flowers available to answer any and all of your questions.